Back by popular demand - our style of the week is The Mustard Marriott. Originally we didn't plan on remaking this colour way (we've had him for 2 years), but due to the amount of requests, Mustard Marriott Polo is back in for Spring/Summer 2013! Mean Mr. Mustard Marriott sleeps in the park, and can now be found in the wardrobes of all Retro and Mod Fashion connoisseurs care of Madcap England. Yes, the classic Madcap 'Marriott' Button Through Polo is making its Mustard debut this season and is looking rather striking! Accept no substitutes! Picture Small Faces frontman and mod icon Steve Marriott, picture sixties mod Carnaby Street fashions - Picture this - 'Mustard Marriott'. This truly is a fab Marriott moment in style - the epitome of Sixties Mod. A button through Mens Retro, Mod polo top with superb contrast colour combination. 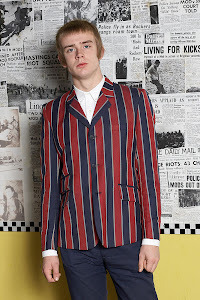 You can even wear it fully open with a shirt and skinny tie for the ultimate Sixties Mod look. Striking and stylish knitted full button cardigan polo jumper. Mens Retro Mod panelled polo jumper in Retro Mustard and Black with white stripe detail. Madcap England branded button through fasten. Block colour Mustard reverse and black polo collar. Tag it and Win it - Winners! Tag it and Win it!